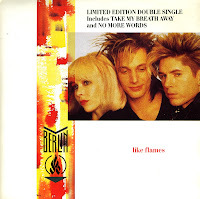 Some time ago I wrote about the double single 'Like flames' by Berlin, which included 'Take my breath away'. I'd almost forgotten that I have the original single as well. Taken from the soundtrack of the movie 'Top Gun', the B-side is a song by Giorgio Moroder with vocals by Joe Pizzulo. It was this single that reached number one in several countries. Berlin was formed in Orange County, California in the late Seventies. The band consisted of John Crawford, David Diamond and Terri Nunn. 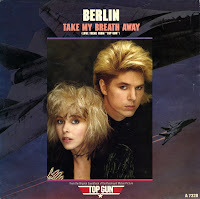 Their big break came in 1987, when they recorded 'Take my breath away' for the hit movie 'Top Gun'. It brought them a number one hit in many countries including the Netherlands and the UK. The band then tried to build on this success with this single, 'Like flames'. This single, and other ones, couldn't match the success with 'Take my breath away', and so the band disbanded within a year.